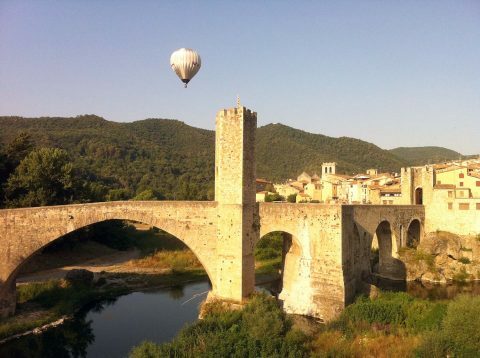 Thanks to the countless historical heritage and its excellent conservation, Besalú has become one of the unmissable tourist destinations in Spain. The extraordinary landscape of the region of La Garrotxa where Besalú is located, is also one of the seductive incentives. The town monuments form a historical complex which shows the influence of the cultural changes in the territory through the centuries. The county town is part of the Spanish network of Jewish towns that attempt to keep alive the memory of the Jewish past of medieval Spain. The mikveh (Micvé in Catalan) is an interesting medieval Jewish baths in very good condition; it was practically untouched and unseen for centuries as it had been buried and built over, and was only rediscovered in the 20th century. It is one of the very few medieval mikvehs that have been found in Europe, so is well worth a visit. 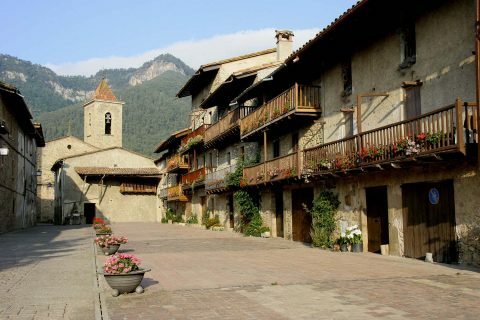 You can enjoy this historical richness from the Besalú tourist office, where you will be informed about the guided tours and the many activities offered by the Villa Condal. Barcelona has the character of the Mediterranean cities: dynamic and open, with countless leisure activities, the city invites you to wander around and enjoy. Barcelona has a lifestyle that makes it unique. Cradle of many cultures and witness of great transformations, the history of Barcelona is fascinating. The sea breeze gets the weather in Barcelona normally pleasant. Extensive hours to buy, to eat and to enjoy yourselves! 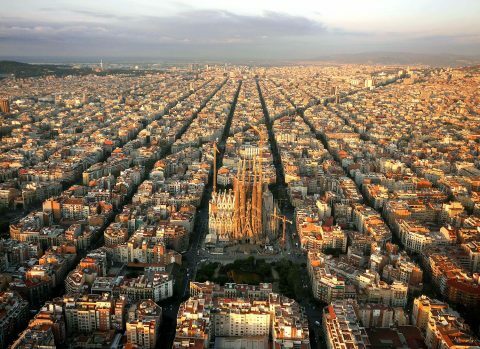 Know a little bit more about Barcelona! 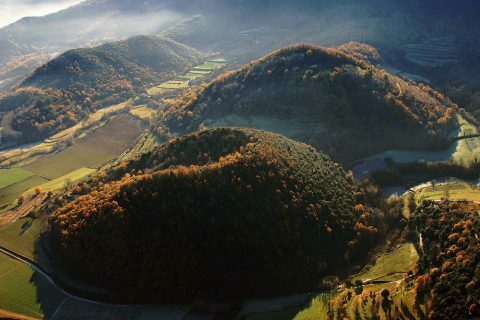 The Volcanic Zone of La Garrotxa is the best exponent of the volcanic landscape of the Iberian Peninsula. It has around 40 volcanic cones and more than 20 lava flows. The orography, the soil and the climate provide a varied vegetation, often lush, with oak and beech groves of exceptional landscaping value. In the Natural Park of the Volcanic Zone of the Garrotxa there are 28 pedestrian itineraries (access to the viewpoint) that pass through the most interesting places of the Natural Park. Most of them are signposted, except some of the longest ones that, if you are used to it, can be easily followed with the help of the Natural Park guide. The Natural Park has an extensive range of activities. Les Planes d’Hostoles is located at the entrance to the Natural Park of the Volcanic Zone of La Garrotxa (Girona). It is the most important volcanic zone of the Iberian peninsula. 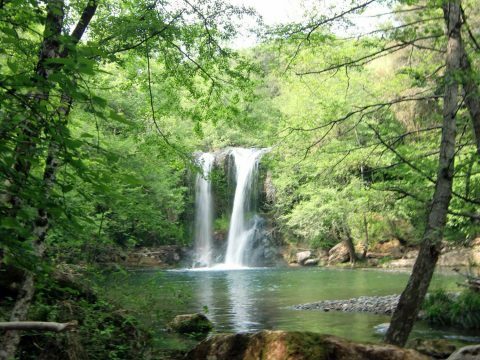 Nature in all its splendor with its forests of oaks and beech trees, puddles and waterfalls, rivers and streams. The town has everything you need to make your stay an unforgettable memory: charming corners, direct access to the bike-lane (Olot-Girona) and essential services such as supermarkets, fishmongers, butchers, pharmacies, public transport, and restaurants. La Fageda d’en Jordà is a natural reserve that includes a forest of beech trees with unique characteristics in Spain, as it grows on a relatively flat terrain formed by a lava flow from the Croscat volcano at 550 and 650m above sea level, an altitude not frequent in the Iberian Peninsula for this type of trees,. It has an extension of about 4.8 km2 and is full of lava’s prominences that can reach more than 20 m in height, called “tossols”. 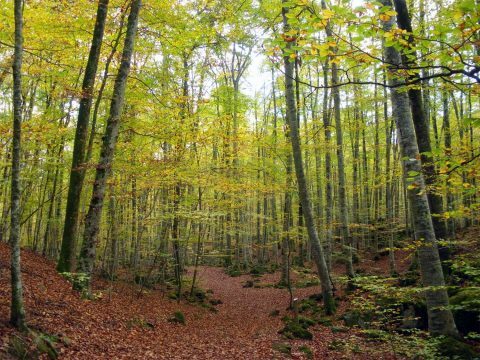 The beech grove is famous because the poet Joan Maragall wrote a well-known poem in its honor :”La Fageda d’en Jordà”. In the main entrance of the grove, in the km 4 of the road from Olot to Santa Pau where the parking of Can Serra is, there is a monolith in his honor. In the forest the use of motor vehicles is prohibited. However, there are several routes on foot and you can rent a horse or an old horse-drawn carriage at km 7 from the road from Olot to Santa Pau. Around a hostel, as the place name describes, and at the foot of the old royal road that went from Olot to Vic it originated one of the most picturesque nuclei in the region. The Hostalets from its beginnings in the 18th century, has experienced moderate and sustained growth. Its remarkable urban features retain the original and autochthonous richness of this place. One of the most beautiful and well-known images of the town, that painters and photographers have immortalized throughout history, is Teixeda Street. It stands out for the houses with the corresponding eras in front, well restored and aligned side by side. If the visit is done in spring or summer, the long wooden balconies show hundreds of flower pots with geraniums and other flowers, thus forming a kind of urban garden with remarkable visual impact; meritorious events that have allowed the town of Hostalets to be cataloged as a historical-artistic site. 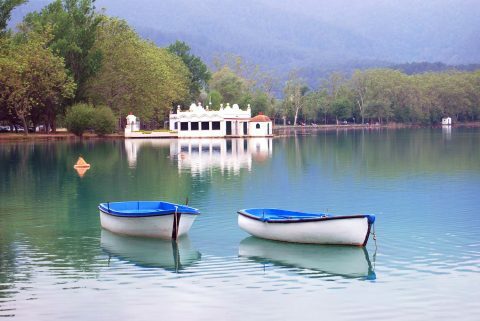 The lake of Banyoles (en catalán, L’Estany de Banyoles), located in the province of Girona, is the largest lake in Catalonia. It is the main symbol of the city of Banyoles. The lake and its lake basin are considered the most extensive karstic complex of Spain, constituting an environmental system of remarkable value. Located in the west of the municipal district of Banyoles, it was declared as an integral part of the Plan of Natural Interest Areas by the Catalan Government. In 2003, the lake was included in the Ramsar list (the list of Wetlands of International Importance) and many people requested to consider it as a Natural Park. 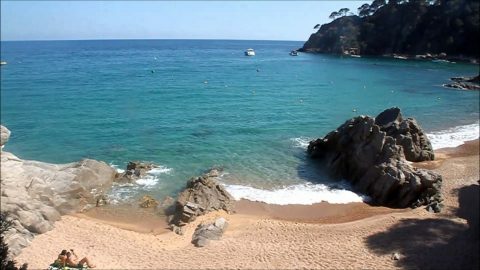 The Costa Brava is an inexhaustible cluster of landscapes, beaches, towns, sensations, people and possibilities. Through its 214 km of coastline we will find natural reserves such as the Cap de Creus or the Medes Islands; villages that retain the seafaring charm that made them be visited by legendary characters such as Cadaqués or the Port de la Selva; tourist centers such as Roses or Platja d’Aro, and different towns such as Calella de Palafrugell or Llafranc that make people come back year after year. We invite the visitor to know the Costa Brava! Girona has all the charm of big cities, but without crowds; a city that is custom-made that will keep you busy: streets, festivals, cultural and historical sites, restaurants, tourist services, events, … Take advantage of this at any time of the year and, if you can, come more than once, because Girona has always surprises to give. In Girona you can do everything. The city, that gathers centuries of history with spectacular monuments, invites you to lose yourself walking through the Old Quarter. It is a lively city, with different events happening every month of the year. 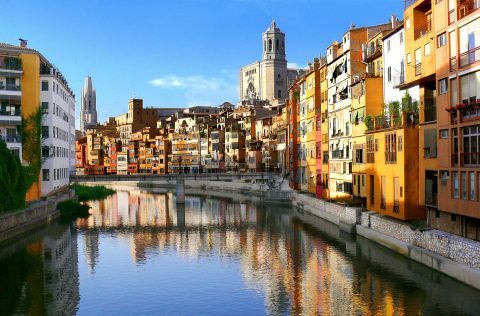 In addition, Girona is nowadays a cultural center with a recognized theater and music program. And if what you want is to do sport, both the city and the surrounding counties give you all the means to practice whatever you want. Everything. Girona is your opportunity.